Is it all about the location? How many times have you heard "Location, location, location!"? Well, it's true! 9 out of 10 people come in to our office looking for "a log cabin, on a couple of acres, with views and trees, privacy, close to the Breckenridge Ski Resort, and would love to have a stream, river, or pond on it". And Fairplay has it all! Let's break down the most common desires and tell you what Fairplay, Alma and all of Park County have to offer. 1. Log Cabin - Most people's dream is to own a log cabin in the mountains. Usually a 3 bedroom or a 2 bedroom plus loft with 2 bathrooms. Park County has many log cabins to offer at a much better price per square foot than the nearby resort towns. Of course, we also have many other types of homes as well. 2. Acreage - Fairplay and the surrounding South Park area has very affordable acreage compared to the resort areas. Where as a half an acre or so about 10 minutes from Breckenridge starts at around $50,000 and an in-town Breckenridge .11 acre lot is priced at $749,900; Fairplay acreage starts at $17,000 for an acre lot within about 40 minutes to Breckenridge. 3. Views and Trees - South Park is a very large and a geographically diverse area. We have land available up high (12,000 feet or so) and down low (9,000 feet or so), with or without trees and views. And we do have some of the best views around. Of course as with anywhere you go, the better the views and trees, the higher the lot prices. 4. Privacy - There are plenty of areas in Park County with privacy. Very few areas in the resort towns have privacy but they do exist (at a higher price, of course). 5. Close to Breckenridge - Alma is about 20 minutes to Breckenridge, Fairplay about 25 minutes. Basically, if you're willing to drive a little further, you'll get much more for your money and still be close to world-class skiing (not to mention a Jack Nichlaus-Designed golf course). Just as an fyi...Keystone is 25 minutes from Breckenridge, Copper is 40 minutes to Breck, Arapahoe Basin is 40 minutes to Breck, Loveland about an hour away. Vail is a little over an hour from Breck (all times approximate). 6. Streams, Rivers, or Ponds - Park County is well known for it's Gold-Medal Fly Fishing and we also have several lakes and ponds within driving distance. The Middle Fork of the South Platte River runs through Alma and Fairplay (kids and adults alike love the Fairplay Beach!). The South Fork of the South Platte River is just a short 15 minute drive south and several other smaller creeks and streams run through the area. The North Fork of the South Platte River is over Kenosha Pass near Bailey. Within 30 minutes of Fairplay is several large reservoirs...Antero, Spinney, and Elevenmile. Tarryall Reservoir and Jefferson Lake are about 40 minutes away. Montgomery Reservoir is just at the base of Hoosier Pass and the great Arkansas River is a short 30 minute drive away! 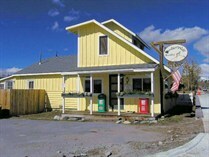 Please visit our web site at http://www.TimberWolfRealty.com and to view a map of the area. Thanks for your time and we hope this helped. We look forward to hearing from you!